by Chet Gaines. 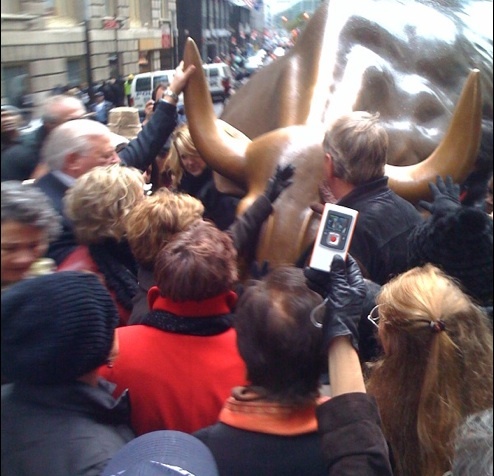 Image from Wonkette of people praying to the Golden Bull on Wall Street for economic improvement. It is simple to see that economic theory is a system of symbols, that it establishes moods and motivations, and that it formulates a conception of existence and order. What is less obvious to the casual observer is the aura of factuality economic conceptions are clothed in. The content that follows should assist the reader in understanding how some of that aura operates to create the realism of economic motivation. It is because of this realism that people believe in economic concepts, regardless of the facts, and that belief in turn gives the concepts social power. First, let’s review the creation story of the monetary market, the birth of money. The creation story of the monetary market economy lies in the myth of barter economies. Though “no example of a barter economy… has ever been described, let alone the emergence from it of money” and “all available ethnography suggests that there never has been such a thing” (Graeber 29), economists have long insisted that this model of economy led to the use of currency. One of the most well-known, though not the earliest, expressions of this myth comes from the work of Adam Smith, who had a specific motivation for telling the story. Though people as early as Aristotle supposed the existence of a barter economy, no one was actually sure of how the transition from barter to monetary economics occurred. The prevailing assumption at Smith’s time was that since governments issued money, the origin of money must have been intertwined with the origin of governments. Smith objected to this notion, preferring the assumption that money and private property predated political institutions. In the process of recording his creation story of money, he created economics. The myth of barter economics never changed, even as more information became available regarding the practices of early economies. In the latter part of the 1800’s Stanley Jevons wrote “what has come to be considered the classic book on the origins of money” (Graeber 29) and borrowed from Smith a hypothetical description of barter in a Native American economy, though accurate descriptions of such economies existed and didn’t match at all what Smith had invented about their culture. The myth of the barter economy lives on even today, though economists sometimes avoid claiming it as historical fact by presenting it as a thought exercise. Economic textbooks often invite the reader to “imagine an economy something like today’s, except with no money” then point out that it “would have been decidedly inconvenient” and conclude for the reader that “people must have invented money for the sake of efficiency” (Graeber 23). It is this unyielding attitude in the face of historical data that leads one to question the scientific nature of economic inquiry. Why should our history of money be “precisely backwards” (Graeber 40) with the assumption that economic activity began with barter instead of debt? The story is told without debt so that we can assume the concept of economic motivations to be sound, even though all ethnography suggests otherwise. This violation of economists’ assumption about human behavior leads us to our next economic myth, the rational self-interested actor. The “dominant assumption in Western society about human motivation” has been that “human beings are basically selfish creatures, driven by their own interests” (Benkler 2). The major debate has been not whether this assumption is warranted, but rather how to manage this seemingly intrinsic quality of humans. There have been two basic solutions put forth to this problem: the force of the state, known as the Leviathan, and the magic of the market, or the Invisible Hand. Over time society has alternated between these two solutions, finding one to be appropriate for a while, then reverting back to the other. But before we argue about which mechanism we should use to manage this intrinsic selfishness of ours, we should first question our assumption of self-interest. While the presumption of universal selfishness has been shown to be faulty, the dominant economic thinking still reflects this age-old myth about our motivations. This assumption has led to an interesting development over the past few hundred years in economic thinking, the deity-like character known as the Invisible Hand. This concept has its roots in Adam Smith’s Wealth of Nations. In the second chapter of the fourth book, Smith writes about a hypothetical preference for domestic rather than foreign industry. This preference for one’s own nation leads to social gain for the nation as well, which was not part of the original intention of the preference. Smith’s basic claim was that this and other selfish acts can lead to social gain. This is the only place in the entirety of the whole five book series where the Invisible Hand is to be found, and yet it has become a rather prevalent metaphor in discussion of the market, reflecting the larger theme of Wealth of Nations. There may be some element of truth in indirectly assisting another through one’s own activities, but should such a mechanism be relied on for social well-being? Faith in the Invisible Hand metaphor has grown to justify all sorts of economic and financial behaviors that demonstrably reduce social well-being. By the close of the twentieth century, a narrower and more exaggerated version of Smith’s self-interested actor had been embraced by economists and business leaders. Unfortunately, when applied incorrect assumptions have real world consequences. Joseph Stiglitz, Chief Economist and Vice-President of the World Bank, has pointed out that time after time economic crises have been “precipitated by economists.” This is in spite of the fact that the economy now “looks a lot more like the economic textbook ideal than did the world of the 1950s” (Keen 2). The facts are that we have followed “erroneous beliefs and ways of thinking about human nature” (Benkler 19), and that this model has permeated “not only… the business world or… the markets” (Benkler 10) but every facet of our lives. How do we come to these faulty notions of what economic behavior means? And how are such notions maintained? These are learned beliefs that result from specific training in economic theory that has its own versions of mathematics and statistics and that is also “ridden with internal inconsistencies” (Keen 18). One of the problematic features of economic theory is its ability to “start with some key proposition, and then contradict that proposition at a later stage” (Keen 18). Professor Keen points out in his book Debunking Economics that economic theory assumes consumers to be both unique and identical in their behavior in order to resolve the issue of being “unable to extrapolate” the behavior of an individual into a coherent analysis of “society as the simple sum of its individual members” (Keen 26-27). But if such contradictions are as simple to recognize as Keen makes them sound, then why is it that most students of economics seem not to recognize these contradictions? Keen explains that “most introductory economics textbooks present a sanitized, uncritical rendition of conventional economic theory” (Keen 5) with conclusions “which would apply if the theory had no logical flaws” (Keen 27). Many only take an introductory course and move on to career oriented courses in accounting, finance or management where these concepts go unchallenged. The minority of students who do persevere with their economic education learn the techniques of economics analysis “with little to no discussion of whether these techniques are actually intellectually valid.” Critical literature is “simply left out” of the instructional material and students are taught “specious assumptions” that resolve observed contradictions (Keen 5). Keen goes on to elaborate about the problems of gaining a mathematical education through economics courses. He explains that the math used in economics courses is isolated from current mathematical methods, which would “undermine much of economic theory” (Keen 6) if applied. The reasoning for having separate courses for economic math is to teach specific concepts related to economics not covered in a more general math course, but the problem is that this separation has led to “peculiar versions of mathematics and statistics” (Keen 6) by not keeping up-to-date with modern mathematical methods. The process Keen lays out is more like the training program of a religion than a scientific discipline of skepticism and falsification. Myths like the barter economy and the self-interested actor are encouraged, while the evidence against these concepts goes undigested. These tales function more as cosmologically orienting stories than they do actual principles and laws of the physical universe. Furthermore, fresh views of our economic possibilities are hindered by market dogmatism which maintains the status quo. A less indoctrinated view of what economics is reveals more than just a few myths, but a new economic paradigm about to unfold. The technology of automation is advancing more than ever, challenging human labor not only physically but also cognitively. Algorithms and robotics are being used to perform tasks once thought to be exclusively in the realm of human labor. The resulting displacement of workers by the automation of labor can be termed technological unemployment, a major factor in our current economic troubles. Technological unemployment is often dismissed by market economists as it is generally believed that technological advancement tends to create more jobs than it destroys. This may have been true in the past, where only people’s physical abilities were challenged by automation. However, with modern applications of algorithms, our brainpower is now being challenged as well. It’s not only factory workers that must worry about losing their jobs to automation, but also journalists, lawyers, surgeons, and practically everyone else. This new level of technology calls for a new level of economic understanding, one recognizing true resource efficiency rather than just market efficiency, which Keen notes “is itself flawed” (Keen 5). Through the application of technological advancements, a greater efficiency can be created resulting in an abundance of resources, a process known as ephemeralization. Since traditional economics defines itself as being concerned only with scarce resources, and since scarcity is a profitable notion, the theory is motivated against creating or recognizing abundance. However, there is a slowly growing appreciation for the abundance that is becoming available through technology, and the efficiency that could result from an abundance based approach, rather than one which assumes scarcity. For example, a market behavior that could be described as ritualistic is that of ownership. Deeming physical or intellectual items as ‘property’ is an attempt at ensuring protection against scarcity. However, given our current ability to create an abundance of all goods needed to sustain society, does it make sense to create scarcity by artificially restricting access to goods? In other words, the ownership metaphysic is itself inefficient and only exaggerates scarcity. It takes a massive amount of resources to enforce this unnecessary notion. In 2011 there were 9,063,173 property crimes in the United States, compared to just 1,203,564 violent crimes (Disaster Center). If the resources used to prevent the vast majority of crimes were suddenly not needed, how much attention could violent crimes receive? Through automation, an abundance of goods could be created and made available to anyone in need of them, effectively bypassing any need for the concept of property because access itself has been guaranteed by the infrastructure. Direct access to goods also resolves the issue of technological unemployment, as it will be harder and harder to pool money from the market to purchase items necessary for living if unemployment continues to increase. This implies a new concept of economy; a concept not based on human labor, but on individual and social well-being as understood by science. The word “economics” comes from a Greek term meaning “management of a household.” As evidenced by the recent meltdown at Fukushima, externalities recognize no national borders. Our household is the entire planet, and we can only make efficient use of its resources by recognizing it as a single system. There is only one biosphere. What happens to it affects us all. We need to redefine economics so that it actually ensures our total well-being to the greatest degree possible while maintaining an ecological balance. We need a holistic economic theory based on empirical data, not traditional notions. Benkler, Yochai. The penguin and the leviathan: How cooperation triumphs over self-interest. New York: Random House, 2011. Print. Bowie, Fiona. The Anthropology of Religion. 2nd ed. Wiley-Blackwell, 2006. Print. Disaster Center. "United States Crime Rates 1960 - 2011." The Disaster Center. Web. 24 Nov 2012. Graeber, David. Debt, The First 5,000 Years. Melville House Pub, 2012. 20. Print. Keen, Steve. Debunking Economics: The Naked Emperor of the Social Sciences. New York: Zed Books, 2003. Print. Rifkin, Jeremy. The end of work. New York, NY: Jeremy P. Tarcher/Penguin a member of Penguin Group, 1995. Print. Commenting on this Story will be automatically closed on December 25, 2013.